I have always wondered when we would begin to think about potty training. I have always wondered how I would handle it, and to be honest it is one of the only aspects I have actually dreaded. Rumour has it that little boys tend to take longer to potty train than little girls. I quite honestly didn’t think we would be thinking about potty training at 21 months. I really thought that I would be leaving it until the Summer months after he had turned 2 before we even began to think about it. I have been aware for a while now that Leo is very conscious of his pee’s and his poo’s. He knows exactly what he is doing, and if given the chance of nappy free time he quite often shames himself by going pee pee on the floor. Over Easter we spent the afternoon at Granny’s house for a big Sunday dinner. I had come prepared with pyjamas so that I could get little man ready for bed and simply put him straight down when we got home. As I changed his nappy, a naked Leo jumped up and ran off laughing at the fact he had escaped without a new nappy on. For a little while he was fine, he was laughing as his Aunty squirmed away from him as he jumped up and down all over her excitedly, naked of course. It was when Alice asked him whether or not he needed a wee that he looked down and suddenly began to pee! All the while laughing as he did it with the most mischievous smile on his cheeky little face! He then began deliberately sprinkling all over the lounge floor. I set my sights on catching the little tinker and getting him in his nappy. 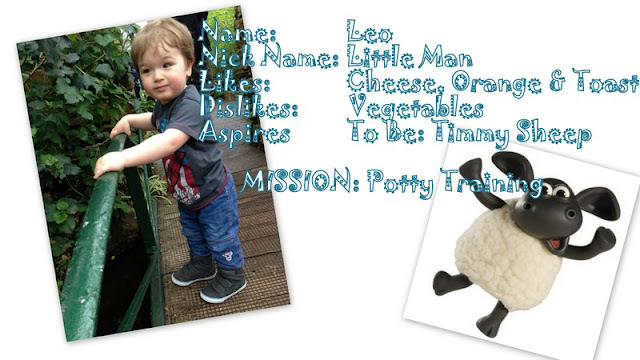 Leo then deliberately sprinkled me in my fight to get that nappy back on his botty! What this little water fight highlighted to me was just how conscious Leo was about what he was doing and when he was doing it. Leo can control what his bladder is doing, he can even stop half way through and then start again moments later! So I am thinking of introducing a potty just to see what he thinks. I will be applying absolutely no pressure and if he wants to do it, then that’s absolutely fine. If he doesn’t want to just yet, well that is absolutely fine too! I will support him the entire way. If he is not yet ready we will simply leave the potty out so that he can become familiar with it and know what it’s purpose is. Judging by how Leo loved sprinkling everywhere over the weekend, I can only imagine that he is going to find it a real novelty being actually allowed to pee pee somewhere other than his nappy. And apparently a little encouragement from Aunts and Uncles (the younger kind, 11 and 15) goes a long way….So maybe I will just enlist them to go motivate Leo into pee peeing in his new potty. I guess this is the start of the rickety rockety road to getting Leo out of nappies one day. I spy an adventure on the horizon! We had a potty around in the house for a while before embarking on any proper training, just to get him used to seeing it. We'd sit him on it, talk about it, you can get some stories about potties too which he really liked. Its a really great start on the way to getting him familiar with a potty before actual training. Good luck Leo. And Laura. It'll be fine. I found it was actually a lot easier than I thought it was going to be.